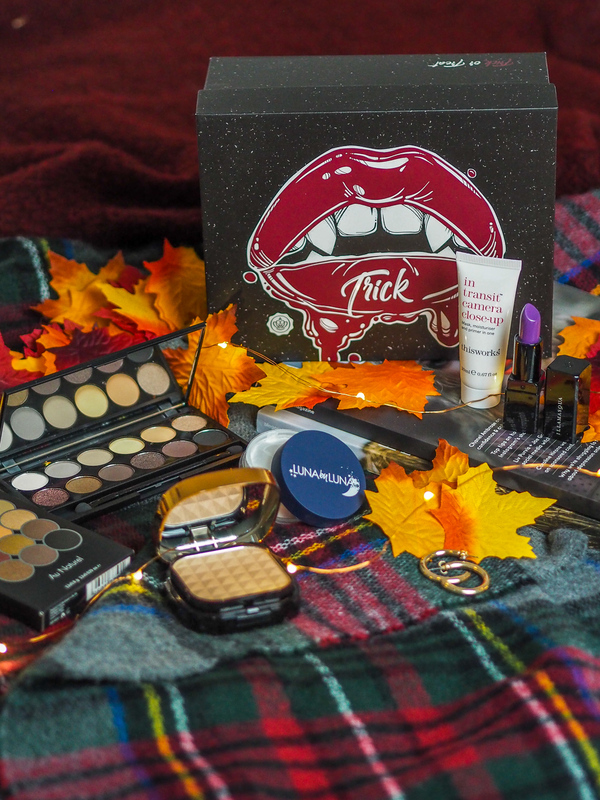 So October is here which means another Glossybox, and a brilliant themed one at that! Obviously, Glossbyox had to go for a fun Haloween theme this month, so they chose to do two boxes – one trick, one treat. Both boxes had different items in so today I’m talking about everything I got in my Trick box. This is another cruelty-free box this month – something Glossybox seems to be doing far more often which is great to see. It’s brilliant that I’m being opened up to some fab cruelty-free brands without having to research it all myself. First up in the Trick box is a lipstick from Illamasqua. 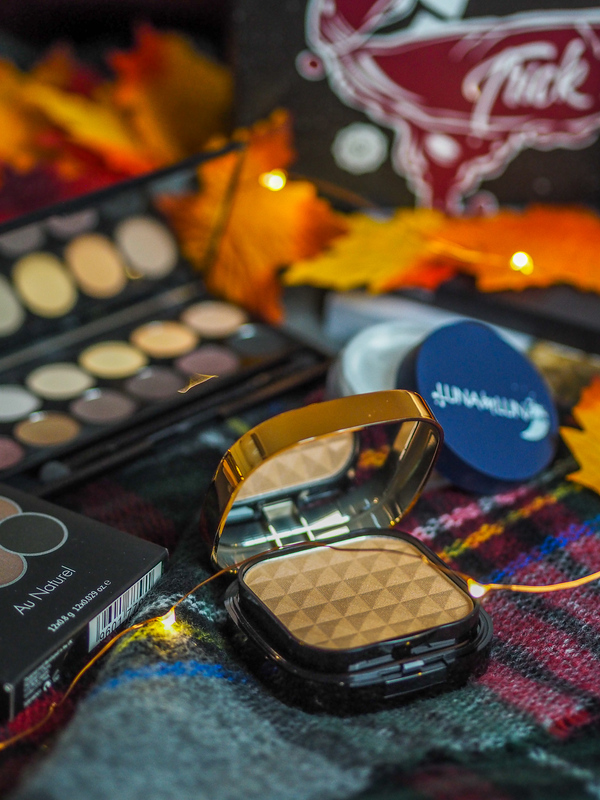 I’m so excited to finally own a product by Illamasqua – I’ve been wanting to try this brand practically ever since I started blogging and it was pretty much everywhere! This is a purple-shade lippy with a semi-matte finish. This is definitely one of those products I’d never buy myself, but I’m glad I’ve got it in this box because I’m keen to give it a try. 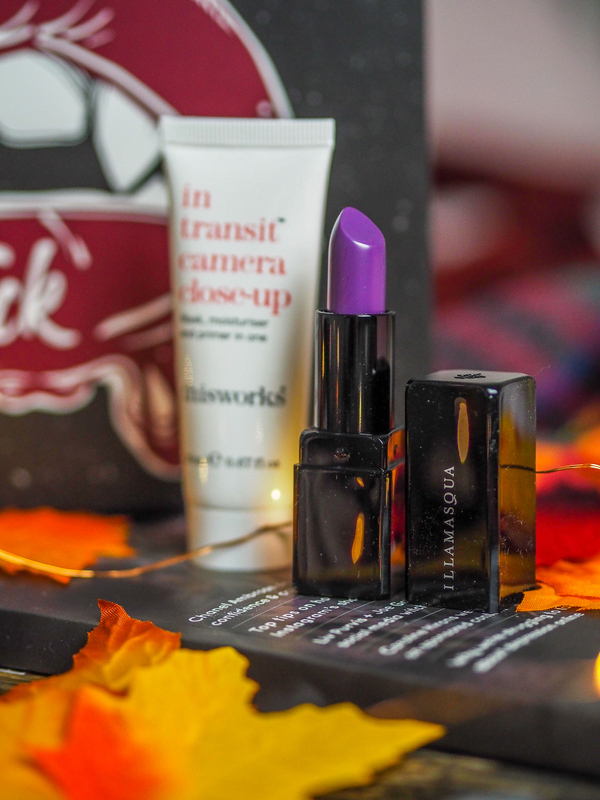 I love a dark red lip in the colder months so I’m hoping I’ll like this bold purple too. I feel like, for drugstore eyeshadow palettes, Sleek are some of the best. This month’s box had the autumnal Au Naturel palette, full of 12 pigmented, long-lasting mineral based shades. A mix of both matte and pearlescent shades, and a mix of the neutral daytime tones and darker smokier shades, this palette has everything covered. A total staple! The only skincare product in this month’s box was In Transit Camera Close-up from This Works. This is a mask, moisturiser and primer all in one. A blend of repairing plant oils, hyaluronic acid, argan and starflower oils and caffeine, this should rapidly erase the signs of fatigue, boost hydration and prep your skin for photo-perfect make-up. This Works is a brand I’m keen to try more from as it’s a brand I’ve loved in the past. So far I’ve tested this out as a moisturiser and primer, and for me, the primer statements aren’t quite what they claim to be. I skipped my primer application in my make-up routine and the results weren’t quite as great. But as far as moisturisers go, this felt my skin feeling suitably hydrated and smooth. Although it claims to be a mask… I can’t quite understand how this works. Do you apply extra and wash it off after 10 minutes? Who knows! Next up was a loose powder from Luna by Luna Cosmetics, another brand I hadn’t heard of previously. This has a lightweight formula designed to soak up excess oil while softening fine lines and hiding pores. It’s recommended to be used with a beauty blender to set concealed areas to keep makeup looking fresh. First things first, WHY OH WHY do they put a sticker over the plastic lids of powders? Last week I sat struggling to peel the plastic off, before chucking white powder allllll over my black work trousers, not cool. Anyhoo, after that early morning disaster, I did use the powder and on first impressions – so far, so good! I’ve only used it once or twice but not with a beauty blender yet. It seemed to set my makeup well and keep it in place throughout the day, and no creasing! The final product this month was a bronze and contour kit from MUA Makeup Academy. This is a super handy 2-in-1 compact with two powder shades – one with shimmer for highlight and one darker for contouring. This is definitely a handy product to have, but with my current bronzing and highlighting collection going strong, I think this is a product I’ll pass onto a friend. This was another fun themed box from Glossybox, and again with some products, I wouldn’t go out and buy for myself, so all in all a success! Remember you can subscribe for your own Glossbybox here, and use LUCY15 for 15% off your first order! "Goals, plans and to-do’s for the last 3 months of 2018"
"6 things to see and do in Norwich"